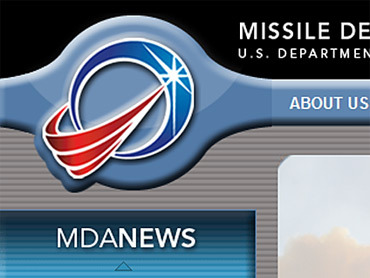 The Drudge Report and other conservative sites are highlighting a newly-unveiled logo for the U.S. Department of Defense's Missile Defense Agency and complaining that the new logo (pictured at left) is reminiscent of both the Obama campaign logo and an Islamic flag. "the new MDA shield appears ominously to reflect a morphing of the Islamic crescent and star with the Obama campaign logo," writes Big Government's Frank Gaffney. "… Team Obama is behaving in a way that -- as the new MDA logo suggests -- is all about accommodating that 'Islamic Republic' and its ever-more aggressive stance." Critics, meanwhile, are mocking the uproar from the right. Tweeted "Zeus": "Drudge is hinting the new Missile Defense Agency logo resembles an Islamic flag's star & crescent. SECRET OBAMA AGENDA!" The MDA describes itself as a Department of Defense "research, development, and acquisition agency" that is "focused on retaining and recruiting a dedicated workforce interested in supporting our national security." The agency is engaged in development and testing of an integrated Ballistic Missile Defense System. You can see the Obama campaign logo here and the Islamic flag star and crescent here.